Among the hundreds of innovations that enhance our business and personal lives, LED technology ranks near the top as one of the most universally applied. LED technology is everywhere. It’s utilized in almost every industry, in multiple applications and in a variety of sizes, shapes and price points. Think Times Square and Broadway billboards, data tickers, airports and casinos, arena and stadium video scoreboards—and just about anywhere that traditional signage can be used. But that is only the beginning. The reasons for the proliferation of LEDs are numerous, and in the case of digital signage and displays, the benefits are clearly visible in terms of scale and image clarity. In addition to providing a great display platform for HD-quality video content, LEDs also provide a highly efficient source of lighting that outlasts all other forms of lighting available today. They reduce energy costs and help protect the environment, and provide the ability to visually transform a venue’s appearance to match event themes. Basically, an LED is just a light bulb without the filament, and its color and illumination intensity are dictated by the movement of electrons in the semiconductor material. The current is then directly transformed into light with no wasted energy. Comparatively, incandescent bulbs produce light by generating heat to warm the filament, which creates significant amounts of wasted energy. Without a filament to burn out, LED life span can exceed more than 50,000 hours, which is equivalent to almost six years of continuous operation.Even after as many as 70,000 hours of 24/7 operation (approximately eight years), they retain nearly three-fourths of their original light output capacity. This is compared to approximately 750 hours for typical incandescent lights, which need replacing on a regular basis. Now, factor in the large number of bulbs needed to light an office building, whether incandescent or compact fluorescent light bulbs (CFLs). The re-lamping costs can be substantial. Because of this, the use of LEDs as direct light sources can be easily justified. For example, a 60-watt incandescent light bulb draws more than $300 worth of electricity per year and provides about 800 lumens of light. An equivalent CFL uses less than 15 watts and costs only about $75 of electricity per year. LED bulbs are even better, drawing less than 8 watts of power, costing about $30 per year, and lasting 50,000 hours or longer. The Department of Energy estimates that replacing regular light bulbs with LEDs could potentially save 190 terawatt-hours annually, which is the equivalent of lighting more than 95 million homes. 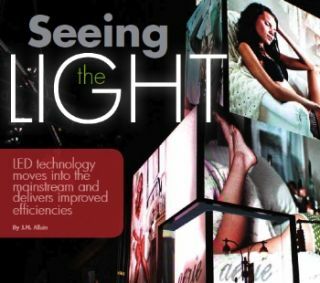 The same claims hold true for LEDs that are used as light sources for large-screen display systems. Per watt, LEDs output more lumens of light than regular incandescent bulbs and use less power. LEDs also have a higher luminous efficacy—which measures how efficiently electricity is converted to visible light—than an incandescent bulb. And because LEDs are based on solid-state technology, they can be more readily controlled and programmed, which makes them one of the most versatile and flexible light sources available today. As a result of the primary materials used to make the diode, LEDs can produce many intensities of light output and any color within the visible light spectrum. Blue LEDs are produced from indium gallium nitride, green are based on aluminum gallium phosphide and red are from an aluminum gallium arsenide. When these three colors are combined, they become "white" light, and the potential for millions of colors is born. According to market indicators, organizations are becoming increasingly eco-conscious, either as part of their corporate responsibilities or in an effort to please sponsors and partner organizations. LED lighting technology is recognized as the future of green lighting, both in facility usage and in large-screen displays, because it offers a sustainable solution to organizations that are addressing environmental concerns. LEDs help reduce greenhouse gas emissions from power plants, which in turn helps lower the carbon footprint; and, since there's no toxic mercury in an LED, they're easier and less expensive to dispose of than CFLs. Due to their electrical semiconductor and solid epoxy resin construction, LEDs do not contain fragile components like those found in incandescent or fluorescent bulbs such as glass, filaments and gases that are easily broken or disrupted. This makes LEDs a remarkably durable and rugged technology capable of withstanding shock, vibration and even extreme temperatures. The right combination of LEDs throughout a facility, whether used for video displays or as a light source, can open up a whole new realm of possibilities, including the ability to create controlled environments with LED signage and lighting that can be programmed to transform venue appearances. LED technology has amazing potential as a platform for a wide variety of business applications well beyond digital signage, which makes it not only the lighting of the future but one of the primary technologies of the future.